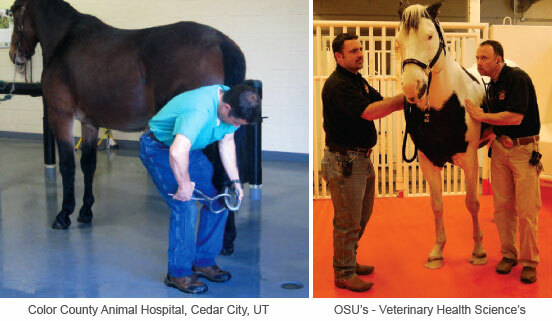 Install DynaSteed™ equine flooring systems & rubber stall mats to protect horses’ health. Consider it for vet hospitals, race tracks & commercial stables! From premiere race track and commercial stables to farms and vet hospitals, DynaSteed™ is ideal for equine health and well being. A revolutionary therapeutic floor designed to enhance equine health and safety, DynaSteed™ is perfect for all horse-related facilities: surgical and training centers, commercial stables, breeding farms, veterinary clinics. 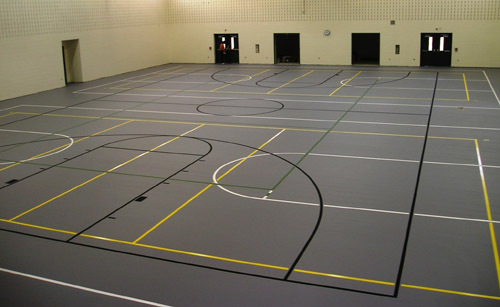 Easy to clean and created to withstand heavy-duty wear and tear, DynaSteed™ is a seamless polyurethane system featuring a strong rubber base mat for greater safety, comfort and resilience. Its poured self-leveling wear coat cures into a tough, flexible membrane which is colored with a hard wearing, mar-resistant structured top coat ─ making it virtually indestructible! DynaSteed’s seamless, hygienic nature cuts maintenance time and cost by half. Fluids can’t seep to subfloors; there is no curling or shifting. The system offers years of use while maintaining aesthetic appeal ─ plus its life span can easily be extended through Dynamic’s cost efficient Refinish! Anti-fatigue, therapeutic properties support joints, tendons and ligaments, reduce fluid accumulation and shoe wear. Unmatched force reduction for equine athletes; may be fine tuned for surgery rooms, recovery stalls, hoof conditions. Slip resistant and comfortable for standing or laying, reducing or eliminating the need for costly, laborious and unhygienic bedding and other shock absorbing materials. Insulated against damp and cold ─ no more wet concrete, dirt or uneven floors. Easy to clean and disinfect due to its seamless, non-porous surface; no unwieldy rubber stall mats, pavers or other seamed systems. 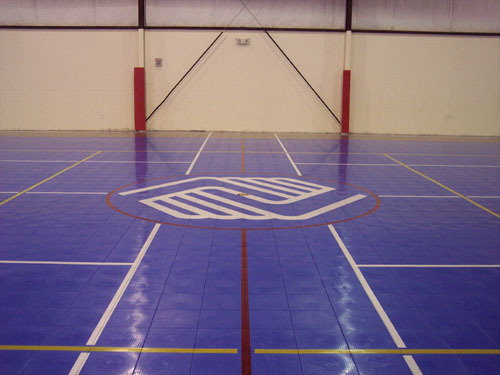 Safe, resilient drain-through flooring may be custom beveled to direct drainage as desired. Long life span, ease of care and Dynamic Refinish ensures cost-efficiency. Made using recycled materials, system is recyclable. Your system thickness, from 8 mm to 20 mm, for desired performance. The surface texture and wear layer you prefer. Customizable force reduction for whatever your needs ─ recovery, surgery, hoof conditions, etc. Custom beveling available to direct fluid drainage as desired. The right warranty for your investment. Your look! We offer 8+ floor color choices. Or ask about customized color and layout choices. Your specific level of tensile strength and elongation. Option to incorporate seamless, integrated wall padding. DynaSteed™: revolutionary therapeutic equine flooring with a wide array of applicability for large animal needs, commercial or private, professional or amateur. Private owners, top equine surgical and rehabilitation veterinarians and more have expressed complete satisfaction with DynaSteed™, endorsing its therapeutic, anti-fatigue benefits. We are a premiere, full-service contractor specializing only in high performance and multipurpose flooring solutions. An American company, we take pride in delivering products made entirely in the USA in an ISO 9001-2000 certified facility. We proudly serve every state in the nation with the most experienced installation technicians in the industry. 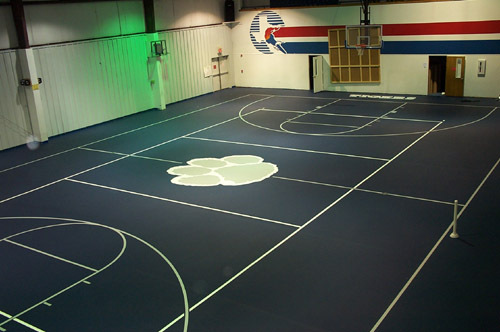 Our teams install 120+ technologically advanced flooring solutions annually. No subcontractors. And we manufacture, sell and install directly to you, the customer, delivering a better product at a better price. Environmental stewardship is at the core of the Dynamic philosophy. We create recyclable products from locally sourced materials, re-using existing and rapidly renewable resources. Our VOC compliant, sustainable systems are eligible for LEED points, require fewer chemicals and are installed with Zero-Mercury product formulations. © Copyright 2016 Dynamic Sports Construction All rights reserved.